Your body is one of the most complex genetic wonders in existence. Contained in your cells is all of the information a person would need to know about your ancestry, physical characteristics, medical history, predisposition for illnesses, childhood conditions, and chronic vitamin deficiencies. If only there was a way to unlock all of that information and use it to create a healthier lifestyle. There are many health issues that are present in the blood. Hormonal imbalance, mineral & vitamin deficiency, or impaired biochemical production are often behind a variety of both common and rare medical conditions. A simple blood test and the subsequent blood diagnostics can help reveal the underlying causes of many potential medical conditions, and highlight other areas of concern before they become problematic. Telomere testing – Tests the length of your telomeres, which Is a better indication of your age than your actual chronological age. 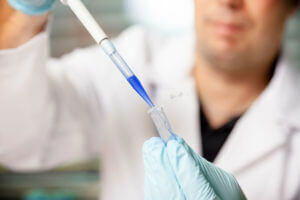 APOe Gene Testing – Determines your risk factor for Alzheimer’s Disease. Cardio Metabolic Testing – Measures the markers of inflammation in your body and checks your blood glucose (sugar) level. Our professionals will take a small sample of your blood, label it, and send it to a laboratory who will then analyze its contents for the presence of certain genetic markers, vitamin deficiencies or indications of age. The lab will then send the results as well as their interpretation back to our office. We then will meet with you and discuss the results and any treatment steps to take that will help you live the healthiest life possible. Why Should I Consent to Genetic Testing? Even if you eat right, exercise and visit the doctor regularly, there are limitations to what you can observe about the body with traditional methods. Even typical blood tests are limited in scope to what is there, not what could potentially be there in the future. Think of genetic testing like accessing your body’s own crystal ball. Not only can it provide you with valuable information about what is currently happening in your body it can provide insight into what your cells have the potential of doing in the future. Curious about your risk for heart disease or Type II diabetes? Cardio Metabolic testing goes beyond the standard snapshot a blood glucose test or cholesterol screening provides. Want to know more about your risk for Alzheimer’s disease? APOe Gene Factor can tell you more about your risk and allow you to begin therapies that prevent the onset of the disease. Do you want to slow the aging process? Telomere testing can tell you how cellular telomere length as an indicator of how rapidly you age compared to the rest of the population. Wonder why you are tired, slow, sluggish, losing your hair, sleeping poorly, or stressed out? Micronutrient testing can reveal deficiencies in more than 36 vitamins or minerals. Talk to your Sandstone doctor today to decide which panel is right for you!